Rep. Patrick T. McHenry, 42, a North Carolina Republican, talks about what he learned as acting whip, his new daughter and his relationship with Rep. Maxine Waters. Q: What was the experience of filling in as acting Republican whip for your friend, Steve Scalise, last year? A: It was an emotional time for all of us, but my goal and the whip team’s goal was to do our work so that Steve could focus on his recovery. It was quite a challenging experience. A lot of work still had to be done. From the very beginning, Steve read me in to all the decisions that were made in the whip office. So the fact that I was completely read in made a big difference when I had to fill in in his absence. We kept his seat just where it always is. I sat where I always sit. And so when he came back, it was a seamless transition for him to return. Q: What’s a big takeaway that you bring back to your role as chief deputy whip? A: It’s not easy. In my role, I can be more aggressive in getting more conversations done. When I was filling in, it was much more difficult to get as many conversations done. There’s more incoming, if you will, than I experienced as chief deputy. But the other takeaway is there’s plenty of work to go around. We’ve got a really good deputy whip table, we’ve got a great whip team and I was even more reliant on them. Q: Tell me about your chairmanship of the House Small Brewers Caucus. A: So this is where a district interest and a hobby collide. Asheville’s one of the coolest places in the country and was the leading edge of the beer renaissance in America. To be able to represent a community like that, it’s not just about the product, it’s about the craftsmanship. It’s about the small businesses that are created out of this, the creativity, the tourism that comes in as a result of it, the wider community effort. So it’s a really cool thing to be a part of, and it’s a blast trying all these new beers. Q: You recently had your second child. How is she doing? A: She’s good. She’s three weeks old. 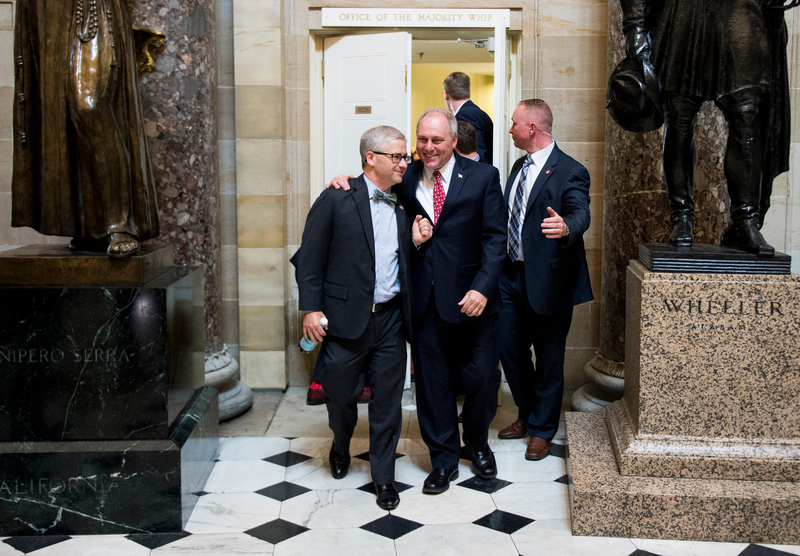 Steve [Scalise] had to go back in for a surgery, and it just so happened that my daughter was born the day he had surgery. So not ideal timing, right? But it worked out. Steve’s surgery went well, and my wife recovered very well and my daughter’s doing very well. Rese’s big sister, Cecelia, is doing very well. When she comes home she says, ‘How’s my baby?’ It’s a very sweet thing, she’s been a great big sister to her. My daughter Cecelia came three weeks after I became chief deputy whip, so a lot of learning both at home and at work. Q: What would you say your biggest fear is? A: FOMO [fear of missing out]. Last book read: “The Oxford History of the French Revolution,” not short and not uplifting at all. “Missing a meal would be a good one too,” his communications director, Jeff Butler, said. “Oh my gosh, let’s not even talk about that. Like midmorning, I’ve got to start thinking about lunch,” McHenry said. If you could have dinner with one person, living or dead: [Alexander] Hamilton. Closest friend across the aisle: I’ve got a very good relationship with and have been able to pass serious legislation with Maxine Waters. I’ve got enormous respect for Maxine; I think she’s smart and capable. I think we’ve got opportunities to do more in the future. And I just like her.